Maria Edgeworth’s slaveholders debate slavery. One morning Mr. Edwards headed out from his plantation to the adjoining one owned by Mr. Jefferies, whom he found stretched on a sofa, drinking coffee. “So much the worse,” replied Mr. Edwards. 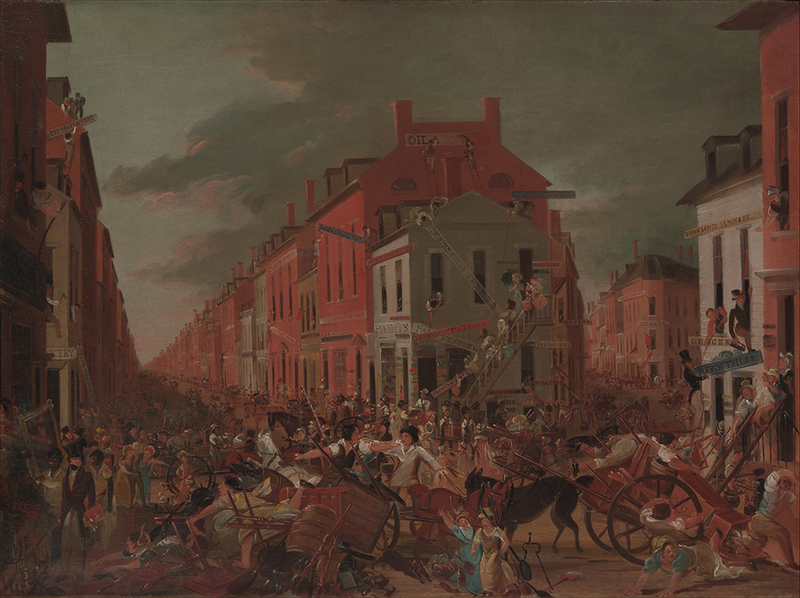 Moving Day (in Little Old New York), by an unknown artist, c. 1827. The Metropolitan Museum of Art, Bequest of Mrs. Screven Lorillard (Alice Whitney), from the collection of Mrs. J. Insley Blair, 2016. To these commonplace desultory observations, Mr. Edwards made no reply, but recurred to poor Caesar and offered to purchase him, at the highest price the sheriff’s officer could obtain for him at market. Mr. Jefferies, with the utmost politeness to his neighbor, but with the most perfect indifference to the happiness of those whom he considered of a different species from himself, acceded to this proposal. Nothing could be more reasonable, he said; and he was happy to have it in his power to oblige a gentleman for whom he had such a high esteem.